This is totally bizarre -- NASA scientists have discovered the extent of extreme conditions that can support life; having once believed that only a few microbes could exist six hundred feet beneath the Antarctic, a NASA team has found a shrimp-like being and a jellyfish. This bizarre shrimp-like lifeform was filmed 600 feet below a massive Antarctic ice sheet (where light does not shine) in NASA's efforts to get the first look at the underbelly of this particular ice sheet. The creature was apparently swimming by and stopped off on the video camera's cable. The scientists also captured a tentacle that they believe belonged to a foot-long jellyfish. This is a great discovery, especially when NASA was "operating on the presumtion that nothing's there". The creature is said to be 3-inches long and orange and is technically known as a Lyssianasid amphipod; a distant relative to the shrimp. 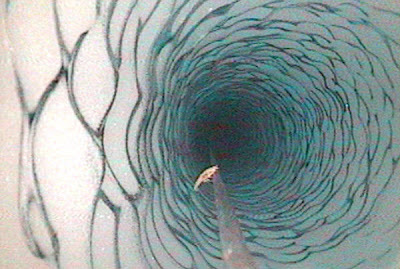 The key question raised by this discovery is if life can thrive 600 feet below Antarctic ice in subfreezing, pitch-black water then what about other hostile environments?